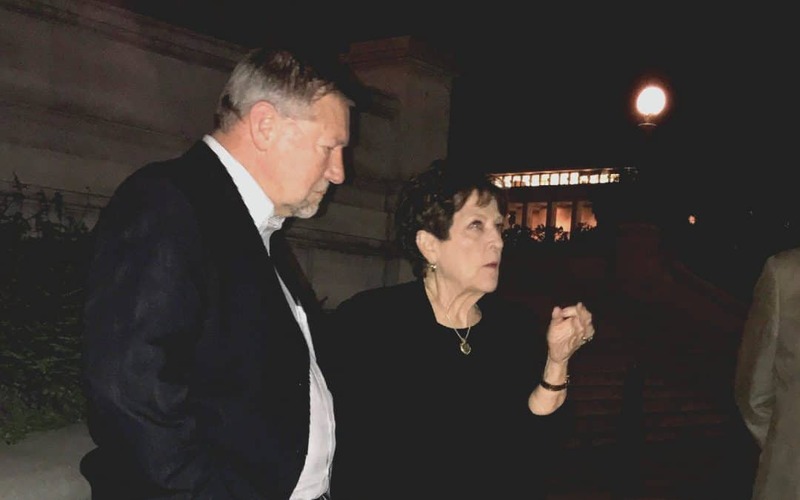 Prayed last night on the Supreme Courts Steps with Dutch Sheets, Shelli, Hannah and 4 other people highly connected in D.C. and powerful pray-ers. The prayer was authoritative. Peace followed as we walked the street back to our centrally located hotel. Headed now to Capitol. This is important day. I know all you are at work at the right hand of the Father. P.S. Click this Link to watch my recent update I posted on Instagram. Thank you so much Dr.Billye, Hannah and Shelli for going for us! We are with you praying!! Praise God Billye, you & Dutch have an anointing to declare a thing and it is established!!! The Glorious Church has arisen! and others for being in His will on behalf of our nation. in the Power of His Blood, and for His Glory. Blessings and anointing from our Father God to you, Sister Billye and team on your “feet on the ground” assignment for our nation. Joining you daily in “first of all” prayers. Standings with you in spirit and truth.Gods will be done! We are praying along with you all. Praying with you, power in numbers against the powers of darkness!!! praying with you. God is good. Praying with you and forwarding to intercessors who pray and stand with you. Thank you Billye, for such a time as this. Faith Tengnagel on Oct. 4, 2018 at 12:25 p.m. Seated in my place at the right hand and standing in agreement with you. Satan will not win. God’s will and purpose will be accomplished! Praying with you and for you next to the Father and the Son. He will show you what to do every step of the way. Seated in heavenly places from the victory. I have been praying in agreement with Dutch Sheets and others for more than a week. God’s righteous WILL rein in Supreme Court. Standing in agreement with ya’ll! Praying in agreement with you all Sister. The gates of hell shall not prevail against us! Coming in agreement that God’s plan will prevail. So enjoy when you are on the Kenneth Copeland program. Thank you Billye for your love for our Lord and His people. Agreeing with you in praying for our Nation, President Trump and VP Pence, and Brett Kavanaugh. Have such deep respect for Mr. Dutch Sheets and his ministry. What a team you will make! Praise Jesus!!!!! Standing in unity with you!! Praying, praying praying! In Jesus name! In agreement with you sister Billye! Praying with you my dear sister Billye. Pleading the Blood! Jesus is Lord! so hankful for your faithfulness in inteceeding and teaching US to interceed as well..adding my agreement to every pray-er praying in line with the Word.. Thank God for the victory! I love and respect you very much Dr. Billye. We will continue believing and voting for righteousness and unity of the faith right through the mid-term elections. Praying for protection of all of you and Judge Kavanaugh’s entire family. Thanking God for surfacing truth. My brother and his wife were ordained through your ministry and many in our family are prayer warriors. We stand with you in prayers for righteousness to prevail through the conformation and the mid-term elections. You are a world changer dear sister Billye. I am proud to know you. Keep up the good work.